Key factors likely to account for the increasing levels of obesity in the UK. Over the last 50 years, the number of people in the UK who are medically obese has risen dramatically. During the 1980s alone, the number doubled. By the year 2005 about 20% of men and 23% of women had a BMI of 30 or more. The prevalence of obesity increases with age, up to about age 65. Then it decreases. Obese people are 2 to 3 times more likely to die young than their lean contemporaries. The total number of people who are 'overweight' - those with a BMI of 25 or more - has also risen. In 1998, it stood at 62.8% of men and 54.3% of women. During the Stone Age, an ability to put on weight was crucial for survival. When food was plentiful, people would 'overeat' and lay down stores of fat to live off during the hard times ahead. Because life often followed a pattern of seasonal starvation it was unusual to be overweight. Genetically those more able to lay down fat stores when food supplies were copious were more likely to survive periods of starvation. Whilst seasonal food shortage is virtually non-existent at the present time in the developed world what had survival benefits has now become a major factor leading to obesity, with consequent ill-health and premature mortality. Twin studies indicate that up to 80% of variance of the BMI may be due to genetic factors (Bouchard, 1994). A small number of genetic disorders can cause obesity. An example is the Prader Willi syndrome. 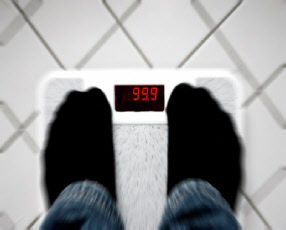 Individuals gain weight as a side-effect of medication, for example chlorpromazine, or as part of a specific medical condition, for example, Cushing’s disease. To account for the high and increasing prevalence of obesity we need to consider factors which have effects across the whole of society. There are changing Patterns of Eating and Exercising. Most people put on weight for a very simple reason: their energy intake is greater than their energy expenditure. In other words, they consume more calories than they use, and the extra calories are stored as fat. Energy is used in the body in 3 main ways: 15% to 40% for physical activity, which includes everything from washing up to walking the dog. (About 100 calories are used for every mile traversed); 10% for thermogenesis (providing body heat or in response to stress); and 50% to 75% to maintain the resting metabolic rate (RMR). The exact RMR relates to weight: higher weight is accompanied by a higher RMR because more energy is needed to maintain cardiac output, gas exchange and liver metabolism. It's a myth that thin people have a faster metabolism. In fact, their metabolism is slower. Fat people consume more calories than thin people. Self-reporting of food intake underestimates the calories consumed in both normal and over weight individuals but under reporting is greater amongst obese individuals (Lichtman 1992). This occurred by as much as 50% in a paper reported by Welle (1992). Our diets are very different from those of our parents. In particular, the proportion of fat we eat has increased dramatically since the Second World War. And, gram for gram, fat contains twice as many calories as either protein or carbohydrate. Its palatability may lead to increased calorie consumption. Socio-economic differences in foods purchased leads to greater risk of obesity in social groups 4 and 5 (HSE 1998). Whilst food intake is largely related to energy needs other factors influence intake significantly eg social setting, stress (‘comfort eating’), boredom, palatability and cost. The social setting in which we eat effects the amount of food consumed: portion sizes are larger in a restaurant than when an individual is choosing portions in a natural setting, and people eat out more now than they did (Stunkard, 1977). Portions in fast-food restaurants are also increasing in size eg Pizzas in response to market research of consumer preferences. Food consumption is also influenced by who we eat with: meals eaten with close friends are up to 20% larger than with other companions; women eat 13% more when eating with a man than when with a woman (though men are reported to be relatively unaffected by their eating companions). The palatability and promotion of high fat foods is commercially driven and large sums of money are directed to shaping brand preferences with little regard to nutritional benefit. Food habits of children are particularly influenced by advertising and immediate access to soft drinks and high carbohydrate foods is promoted commercially. The increase in people living alone or who are ‘time-poor’ because of their work hours has led to an increase in convenience foods. Convenience foods are usually pre-prepared and have a higher content of sugar, fat and salt than meals that would be prepared at home. The calorie content of these foods is high. They now include chilled ready-made meals, the consumption of which has increased by 40% in the past four years. Market research shows nearly one in three British adults currently eats a ready-made meal more than once a week (Bourgeois, 2003). Adults are more typically ‘white-collar’ workers, doing less manual work and spending more time desk-bound. People drive where before they might have walked or cycled. On top of that, the average adult watches over 26 hours of television every week (changing channels with a remote control). Children play less ‘school games’ and run around at home less; they may live in high-rise flats and prefer sedentary occupations with a computer or watching television. Parents may discourage children from physical activities out of doors which they can’t keep an eye on (because of concern about child abuse) and take their children to school in a car. It is very important to moderate the existing prevalence of obesity in the developed world. How to do this requires public education possibly backed by legislation. The latter may prove contentious and take a long time. And ‘it ain’t over till the fat lady sings’!